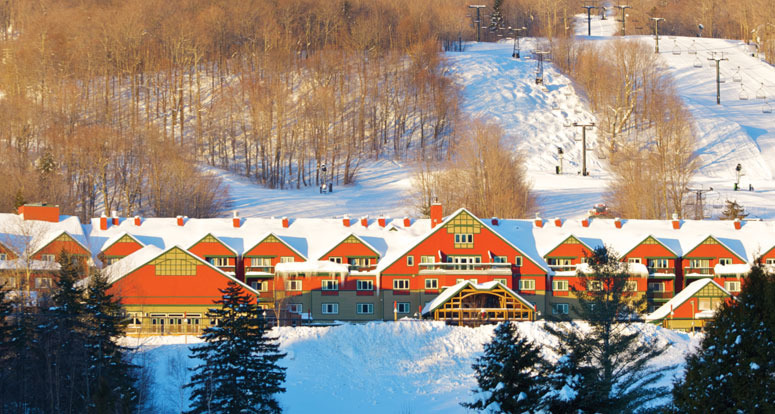 The Grand Summit Resort Hotel features SKI-IN / SKI-OUT hotel and studio rooms plus one or two bedroom condominium units. Most condo units are loft style with at least one bedroom upstairs with half wall opening over living room. Guests will enjoy full-service amenities in an elegant setting. Valets parking and bell staff are eager to help all guests make their stay as convenient as possible. Each studio unit and all suites feature fully-equipped kitchen including dishwasher and microwave, as well cable TV with VCR. Guests can enjoy elegant dining in Harriman's Restaurant, light fare in the pub or Route 66 Cafe, deli fare in the Grand Country Deli, or simply relax and order room service. There is a full-service convenience store, as well as a ski and sports shop on-site, and all guests have free use of the health club which features a sauna, steam room, outdoor heated pool, hot tub, fitness classes, and exercise equipment. Breakfast is INCLUDED (except after 3/31/18 ) for all stays when booking this property.